Cast aluminum plenum, beautifully finished with black powder coating and natural aluminum highlights. The plenum is designed to fit most American 4 barrel carb that have a 5-1/8” flange. Also will fit the Weber DGV carburetor when used with K&N adapter 85-1061. 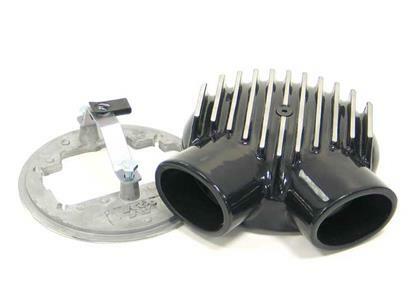 Designed for cold air intake, plenum has a single snorkel outlet that can be fitted with a 4” I.D. hose running to a remote air filter. 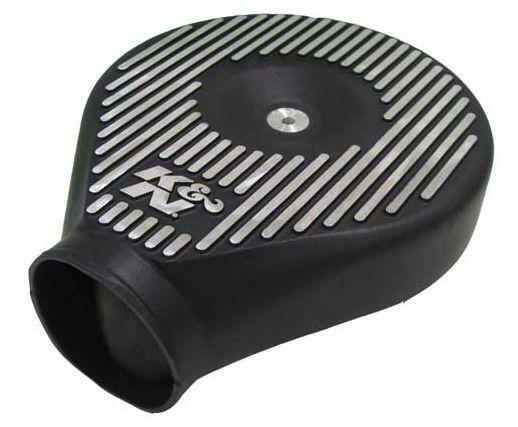 A K&N universal filter with a 4” flange can also be clamped directly on the snorkel as well. See the Universal pages for filters that will fit onto the inlet. The outside diameter of the plenum is 9” and the snorkel sticks out 6” from the center of the plenum. Minimum clearance required above the carburetor flange is 3-1/8”. Customer must provide 1/4”-20 hold down stud. Cast aluminum plenum designed to fit the Weber DGV carburetors. Single or dual snorkel accepts 2-1/2” I.D. hose or any 2-1/2” flanged K&N universal air filter (See Universal pages for filters that will fit). Ideal for cold air applications with remote mounted air filter, the diameter at the carburetor flange is 5-1/8”, and the snout sticks out 5” from the center of the adapter. The clearance needed above the carburetor flange is 2-1/2”.